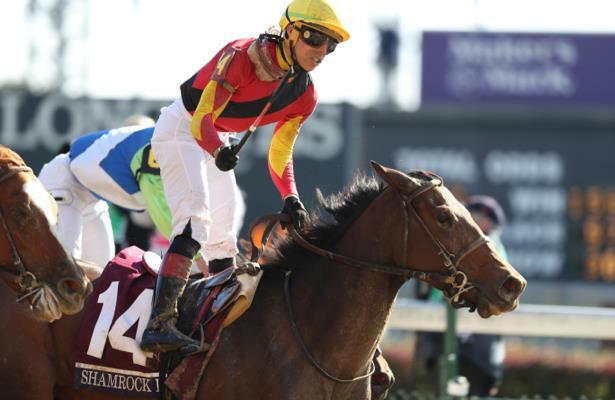 Conrad Farms’ Shamrock Rose, upset winner of the 2018 Breeders’ Cup Filly & Mare Sprint at Churchill Downs in November and an Eclipse Award finalist for champion female sprinter, will commence her 4-year-old campaign Saturday in the Grade 3, $150,000 Fasig-Tipton Hurricane Bertie at Gulfstream Park. The seven-furlong dirt race for fillies and mares, 4 years old and up, drew a competitive field of eight, and is one of nine stakes on a 12-race program, sharing the spotlight with the main events, the $9 million Pegasus World Cup Invitational (G1) and the inaugural running of the $7 million Pegasus World Cup Turf Invitational (G1), the richest races on either surface in North America. Among the challengers Shamrock Rose will encounter in the Fasig-Tipton Hurricane Bertie is Stonestreet Stables’ homebred Dream Pauline, a winner of three of four starts, including a determined victory in the Sugar Swirl (G3) at Gulfstream Park last month in the slop. Also in the field is local graded stakes winner, Stormy Embrace, who finished second in the Sugar Swirl for trainer Kathleen O’Connell. Trained by Mark Casse, Shamrock Rose, a Pennsylvania-bred daughter of First Dude, earned her Filly & Mare Sprint crown with a determined late run that gave her a head victory at odds of 25-1. Irad Ortiz Jr., an Eclipse Award finalist for his outstanding 2018 season, has the return mount. The Breeders’ Cup marked the filly’s fourth consecutive win, and was preceded by scores in the Raven Run (G2) at Keeneland; the La Lorgnette at Woodbine; and the restricted Malvern Rose at Presque Isle Downs. As a 2-year-old, Shamrock Rose won Woodbine’s Ontario Debutante in her career debut. “She’s been a team effort,” Casse said. “We bought her as a 2-year-old and then she ran well as a 2-year-old and then she kind of tailed off. We sent her home to our training center and give her a little break and, boy, she came away from there like hell on wheels. Casse said he believes confidence has played a major role in Shamrock Rose’s development. “I’m a big believer in confidence,” Casse said. “She reminds me a little bit of Tepin, who struggled at the end of her 3-year-old year. We gave Tepin a break and we brought her back and she was just so good. Shamrock Rose drew Post 4. The Kiaran McLaughlin-trained Dream Pauline, a royally bred daughter of Tapit out of the Grade 1-winning dam Dream Rush, has raced just four times in her career. The 4-year-old has won three of those starts, with her only loss coming when she finished third in the Dream Supreme at Churchill Downs in November. Her connections pre-entered their filly in the Breeders’ Cup Filly & Mare Sprint, but Dream Pauline failed to gain a berth in the field. The Fasig-Tipton Hurricane Bertie marks the first time Dream Pauline has raced beyond six furlongs. Dream Pauline, with Hall of Famer Castellano aboard, drew Post 2. Awestruck, who finished second in the Dream Supreme, before finishing fifth in the Sugar Swirl, will start for owner G. Watts Humphrey Jr. and trainer George “Rusty” Arnold. Brian Hernandez Jr. has the assignment from Post 3. Also entered are Blamed, a Grade 3 winner for Hall of Fame trainer Bill Mott; Pacific Gale, the third-place finisher in the Sugar Swirl; Victory Rally, the winner of the Geisha Stakes at Laurel in November; and recent Gulfstream Park allowance winner Ms Meshak.